Good news, we will once again be hosting a Yonex Demo Event. This is a great opportunity to try out their entire range of rackets to find the type of racket that suits your style of play. 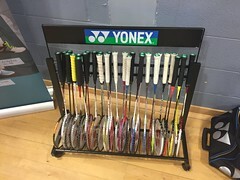 Being able to play with all the different rackets will give you an appreciation of the differences (weight, balance, flex, string tension etc) between them so that you can understand the characteristics of your ideal racquet. Richard Barnett, a local Yonex and ERSA Certified Stringer, will also be on hand to give advice. If you've got any rackets that could do with a restring then he will be able to sort you out. Although there is no obligation to buy anything, he will also be able to take orders for any rackets or other equipment for those who fall instantly in love! Being able to try rackets out before you buy them is a fantastic, and extremely rare, opportunity that you won't want to miss! The event is free and will take place on Sunday 24th June 2018 at Balcarras Sports Centre, from 8pm until 10pm. If you are planning to attend then we would appreciate a quick e-mail to let us know, so that we can plan accordingly.